1903 – the year of writing “Silence”. The year when Nesterov, who had long sought inspiration and images for a new picture, which was to be called “Holy Russia,” finally found what he was looking for. His discovery was a small monastery in the Siberian wilderness – the Solovki monastery. Life in it was simple and often difficult – to devote the whole day to services would not work even on a big holiday. “We pray to God in the forest, with an ax and saw,” the monks talked about themselves, and laughed. The whole world around them was a temple for them in the absence of the opportunity to close the world in the present temple. Dawn, silence over the river, animals and birds – all led them to thoughts about God, about how simply and intelligently he arranged everything, about how good he is. They prayed in the morning and in the evening, at work and after work. The way of their life was so impressed by the artist, who was used to the bustle of cities and a completely different approach, that the picture was born quickly. It has a white night, so the sun is not visible. It hides behind the horizon, ready to emerge from there very soon, and its light, near and diffused, floods the mountainside overgrown with forests. 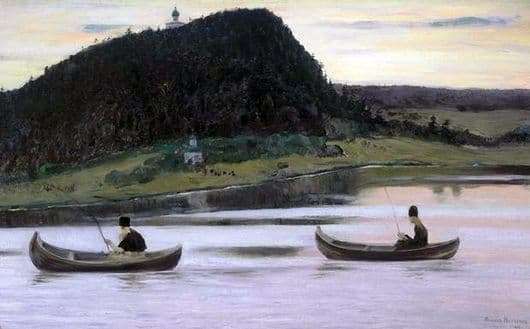 Illuminates the monastery, two monks in the boats. Their image is repeated, as if by a reprise – like an echo in the forest, they are similar to each other. Same pose, black cassocks. Fishing rods in hand. Despite the fact that the old man is on the left and the young man is on the right, they resemble each other, because the observer is deprived of the opportunity to look into their faces. This is not necessary. After all, the picture is not about people, but about nature, about the temple of God, which the whole world becomes, and into which a person can enter if he is reverently silent and does not tear down what has come to him from God. Close-ups, lightness of lines, seeming incomplete details – everything serves to create an impression of pacifying silence, in which answers to all questions are hidden. Silence is the key to them. Be quiet – and hear.